Please find attached agenda for the General Meeting to be held at the Roma Administration Centre on November 9, 2011 at 9.00AM. 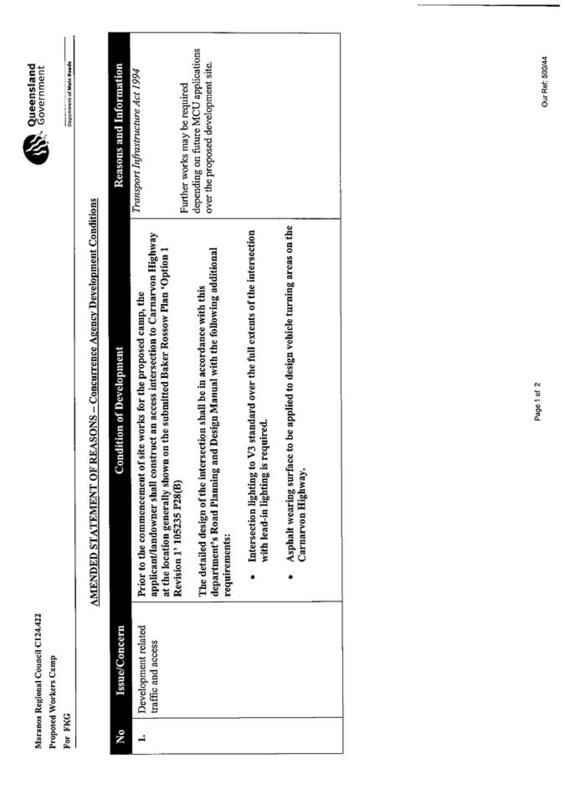 This application seeks to carry out a Material Change of Use – Undefined Use (Temporary Workers’ Camp - 1008 persons in 5 stages) on land at corner Warrego and Carnarvon Highways, Roma Qld 4455 and described as Lot 6 on RP227971. The proposal will establish a Temporary Workers’ Camp of 1008 units in 5 stages. 1. The use for a Temporary Workers’ Accommodation approval in total is limited to an operating time of seven (7) years from the commencement of the first stage of the use regardless of how many stages have been completed. 2. At the end of the seven (7) lapsing period, the site must be returned to its original state with all buildings removed from the site within 3 months of the lapsing of the development permit. 3. The rehabilitated site must not pose a dust hazard to neighbouring sites or traffic on adjoining roads. NOTE: SEE CONDITIONS FOR INDIVIDUAL STAGES BELOW. 4. Complete and maintain the approved development as follows: (i) generally in accordance with development approval documents and (ii) strictly in accordance with those parts of the approved development which have been specified in detail by the Council or Referral Agency unless the Council or Referral Agency agrees in writing that those parts will be adequately complied with by amended specifications. 5. Complete and maintain all operational, building and plumbing and drainage work associated with this development approval, including work required by any of the development approval conditions. 7. Stormwater must not be allowed to pond on the property being developed during the development process and after development has been completed unless the type and size of ponding has been agreed in writing by the Council or as a specific development approval condition. 8. Any increases in volume, concentration or velocity of stormwater from the property being developed must be channelled to lawful points of discharge or to other storage or dispersal arrangements which must all be agreed in writing by the Council. 9. There must be no increases in any silt loads or contaminants in any overland flow from the property being developed during the development process and after development have been completed. 10. The stormwater disposal system must be designed to include appropriate pollution control devices or methods to ensure no contamination or silting of creeks or other waterways. 11. Soil erosion and sediment is controlled in accordance with Schedule 6: “Standards for Stormwater Drainage”. 12. If there is a possibility of erosion or silt or other materials being washed off the property being developed during the development process, the developer must document and implement a management plan that prevents this from occurring. 13. During construction, soil erosion and sediment is to be managed in accordance with Schedule 7: “Standards for Construction Activity”. 14. The site must be provided with on-site effluent disposal systems designed in accordance with Schedule 5: “Standards for Sewerage Supply”. 15. The site must be provided with a water connection, up to but excluding a water meter, to the water distribution network. 16. All services installation, including sewer, water, gas, electricity and telecommunications connections to the respective networks, must comply with (i) the development approval conditions, (ii) any relevant provisions in the planning scheme for the area, (iii) Council’s standard designs for such work where such designs exist (iv) the EDROC Standards Manual where it applies (v) any relevant Australian Standard that applies to that type of work and (vi) any alternative specifications that Council has agreed to in writing and which the developer must ensure do not conflict with any requirements imposed by any applicable laws and standards. 17. At all times while the use continues, waste containers shall be maintained in a clean and tidy state and shall be emptied and the waste removed from the site on a regular basis. 18. Vehicle manoeuvring areas must be provided on-site so that all vehicles can enter and leave the site in a forward direction. 19. The landowner shall be responsible for construction and maintenance of vehicle crossovers from the road carriageway to the property boundary and for obtaining any approvals that may be required and for complying with the applicable designs and standards. 20. All landscaping, streetscaping, vehicular access, parking, roads, bikeways, footpaths, street lighting, parks, street plantings, street furniture and related items must comply with (i) the development approval conditions, (ii) any relevant provisions in the planning scheme for the area, (iii) Council’s standard designs for such work where such designs exist (iv) Schedule 2: “Standards for Roads, Car Parking, Access and Manoeuvring Areas” (v) any relevant Australian Standard that applies to that type of work and (vi) any alternative specifications that Council has agreed to in writing and which the developer must ensure do not conflict with any requirements imposed by any applicable laws and standards. 21. Provide a total of 187 car parking spaces on the site in accordance with the approved plans. 22. All carparking spaces and driveway areas are to be sealed with an approved impervious surface. Surfacing shall consist of either patterned, reinforced concrete, concrete pavers, segmental clay pavers, asphaltic hotmix or two coat (primerseal/seal) bitumen seal. 23. Services and infrastructure required in connection with the establishment of the approved development must be provided at no cost to Council. 24. Landscaping shall be undertaken in accordance with approved Plan No. 1035-004 Issue B Landscape Plan and Site Section - Stage 1 dated 18/03/2011 As Amended in Red prior to the commencement of the use. 25. Any damage to roads and infrastructure that is attributable to the progress of works on the site or vehicles associated with the development of the site, must be repaired to Council’s satisfaction or the cost of repairs paid to Council. 26. Lighting of the site, including any security lighting, shall be such that the lighting intensity does not exceed 8.0 lux at a distance of 1.5 metres from the site at any property boundary. 27. All lighting shall be directed or shielded so as to ensure that no glare directly affects nearby properties. 28. Any airconditioning, generator, refrigeration, pump, exhaust, fans, processing or other equipment must be acoustically screened to ensure noise levels do not exceed 5dB above the background noise level. 29. All buildings are to comply with the approval documents. 30. Any proposed advertising devices shall be subject to a further development application and planning approval unless the advertising devices are in accordance with the exempt or self assessable requirements of the relevant Council planning scheme. 31. The developer is responsible for meeting all costs associated with the approved development unless there is specific agreement by other parties, including the Council, to meeting those costs. 32. Any conflicts associated with proposed and existing services shall be forwarded by the developer to the appropriate controlling authority for approval for any proposed changes. 33. All civil and related work shall be designed and supervised by RPEQ Registered Professional Engineers of Queensland (RPEQ) who are competent in the construction of the works. 34. All development approval conditions related to the establishment of the approved development must be fulfilled prior to any approved use commencing. 35. No nuisance is to be caused to adjoining properties and occupiers by the way of noise, odour, smoke, dust, vibration, rubbish, contaminants, stormwater discharge or siltation at any time. 36. Applicant to advise of date of commencement of Stage 1. 37. Complete and maintain the approved development as follows: (i) generally in accordance with development approval documents and (ii) strictly in accordance with those parts of the approved development which have been specified in detail by the Council or Referral Agency unless the Council or Referral Agency agrees in writing that those parts will be adequately complied with by amended specifications. 38. Complete and maintain all operational, building and plumbing and drainage work associated with this development approval, including work required by any of the development approval conditions. 40. Stormwater must not be allowed to pond on the property being developed during the development process and after development has been completed unless the type and size of ponding has been agreed in writing by the Council or as a specific development approval condition. 41. Any increases in volume, concentration or velocity of stormwater from the property being developed must be channelled to lawful points of discharge or to other storage or dispersal arrangements which must all be agreed in writing by the Council. 42. There must be no increases in any silt loads or contaminants in any overland flow from the property being developed during the development process and after development have been completed. 43. The stormwater disposal system must be designed to include appropriate pollution control devices or methods to ensure no contamination or silting of creeks or other waterways. 44. Soil erosion and sediment is controlled in accordance with Schedule 6: “Standards for Stormwater Drainage”. 45. If there is a possibility of erosion or silt or other materials being washed off the property being developed during the development process, the developer must document and implement a management plan that prevents this from occurring. 46. During construction, soil erosion and sediment is to be managed in accordance with Schedule 7: “Standards for Construction Activity”. 47. The site must be provided with on-site effluent disposal systems designed in accordance with Schedule 5: “Standards for Sewerage Supply”. 48. The site must be provided with a water connection, up to but excluding a water meter, to the water distribution network. 49. All services installation, including sewer, water, gas, electricity and telecommunications connections to the respective networks, must comply with (i) the development approval conditions, (ii) any relevant provisions in the planning scheme for the area, (iii) Council’s standard designs for such work where such designs exist (iv) the EDROC Standards Manual where it applies (v) any relevant Australian Standard that applies to that type of work and (vi) any alternative specifications that Council has agreed to in writing and which the developer must ensure do not conflict with any requirements imposed by any applicable laws and standards. 50. At all times while the use continues, waste containers shall be maintained in a clean and tidy state and shall be emptied and the waste removed from the site on a regular basis. 51. Vehicle manoeuvring areas must be provided on-site so that all vehicles can enter and leave the site in a forward direction. 52. The landowner shall be responsible for construction and maintenance of vehicle crossovers from the road carriageway to the property boundary and for obtaining any approvals that may be required and for complying with the applicable designs and standards. 53. All landscaping, streetscaping, vehicular access, parking, roads, bikeways, footpaths, street lighting, parks, street plantings, street furniture and related items must comply with (i) the development approval conditions, (ii) any relevant provisions in the planning scheme for the area, (iii) Council’s standard designs for such work where such designs exist (iv) Schedule 2: “Standards for Roads, Car Parking, Access and Manoeuvring Areas” (v) any relevant Australian Standard that applies to that type of work and (vi) any alternative specifications that Council has agreed to in writing and which the developer must ensure do not conflict with any requirements imposed by any applicable laws and standards. 54. Maintain a total of 187 existing car parking spaces on the site, for use by Stages 1 and 2 in accordance with the approved plans. 55. All carparking spaces and driveway areas are to be sealed with an approved impervious surface. Surfacing shall consist of either patterned, reinforced concrete, concrete pavers, segmental clay pavers, asphaltic hotmix or two coat (primerseal/seal) bitumen seal. 56. Services and infrastructure required in connection with the establishment of the approved development must be provided at no cost to Council. 57. Landscaping shall be undertaken in accordance with approved Plan No. 1035-004 Issue B Landscape Plan and Site Section - Stage 2 dated 18/03/2011 As Amended in Red prior to the commencement of the use. 58. Any damage to roads and infrastructure that is attributable to the progress of works on the site or vehicles associated with the development of the site, must be repaired to Council’s satisfaction or the cost of repairs paid to Council. 59. Lighting of the site, including any security lighting, shall be such that the lighting intensity does not exceed 8.0 lux at a distance of 1.5 metres from the site at any property boundary. 60. All lighting shall be directed or shielded so as to ensure that no glare directly affects nearby properties. 61. Any airconditioning, generator, refrigeration, pump, exhaust, fans, processing or other equipment must be acoustically screened to ensure noise levels do not exceed 5dB above the background noise level. 62. All buildings are to comply with the approval documents. 63. Any proposed advertising devices shall be subject to a further development application and planning approval unless the advertising devices are in accordance with the exempt or self assessable requirements of the relevant Council planning scheme. 64. The developer is responsible for meeting all costs associated with the approved development unless there is specific agreement by other parties, including the Council, to meeting those costs. 65. Any conflicts associated with proposed and existing services shall be forwarded by the developer to the appropriate controlling authority for approval for any proposed changes. 66. All civil and related work shall be designed and supervised by RPEQ Registered Professional Engineers of Queensland (RPEQ) who are competent in the construction of the works. 67. All development approval conditions related to the establishment of the approved development must be fulfilled prior to any approved use commencing. 68. No nuisance is to be caused to adjoining properties and occupiers by the way of noise, odour, smoke, dust, vibration, rubbish, contaminants, stormwater discharge or siltation at any time. 69. Complete and maintain the approved development as follows: (i) generally in accordance with development approval documents and (ii) strictly in accordance with those parts of the approved development which have been specified in detail by the Council or Referral Agency unless the Council or Referral Agency agrees in writing that those parts will be adequately complied with by amended specifications. 70. Complete and maintain all operational, building and plumbing and drainage work associated with this development approval, including work required by any of the development approval conditions. 72. Stormwater must not be allowed to pond on the property being developed during the development process and after development has been completed unless the type and size of ponding has been agreed in writing by the Council or as a specific development approval condition. 73. Any increases in volume, concentration or velocity of stormwater from the property being developed must be channelled to lawful points of discharge or to other storage or dispersal arrangements which must all be agreed in writing by the Council. 74. There must be no increases in any silt loads or contaminants in any overland flow from the property being developed during the development process and after development have been completed. 75. The stormwater disposal system must be designed to include appropriate pollution control devices or methods to ensure no contamination or silting of creeks or other waterways. 76. Soil erosion and sediment is controlled in accordance with Schedule 6: “Standards for Stormwater Drainage”. 77. If there is a possibility of erosion or silt or other materials being washed off the property being developed during the development process, the developer must document and implement a management plan that prevents this from occurring. 78. During construction, soil erosion and sediment is to be managed in accordance with Schedule 7: “Standards for Construction Activity”. 79. The site must be provided on-site effluent disposal systems designed in accordance with Schedule 5: “Standards for Sewerage Supply”. 80. The site must be provided with a water connection, up to but excluding a water meter, to the water distribution network. 81. All services installation, including sewer, water, gas, electricity and telecommunications connections to the respective networks, must comply with (i) the development approval conditions, (ii) any relevant provisions in the planning scheme for the area, (iii) Council’s standard designs for such work where such designs exist (iv) the EDROC Standards Manual where it applies (v) any relevant Australian Standard that applies to that type of work and (vi) any alternative specifications that Council has agreed to in writing and which the developer must ensure do not conflict with any requirements imposed by any applicable laws and standards. 82. At all times while the use continues, waste containers shall be maintained in a clean and tidy state and shall be emptied and the waste removed from the site on a regular basis. 83. Vehicle manoeuvring areas must be provided on-site so that all vehicles can enter and leave the site in a forward direction. 84. The landowner shall be responsible for construction and maintenance of vehicle crossovers from the road carriageway to the property boundary and for obtaining any approvals that may be required and for complying with the applicable designs and standards. 85. All landscaping, streetscaping, vehicular access, parking, roads, bikeways, footpaths, street lighting, parks, street plantings, street furniture and related items must comply with (i) the development approval conditions, (ii) any relevant provisions in the planning scheme for the area, (iii) Council’s standard designs for such work where such designs exist (iv) Schedule 2: “Standards for Roads, Car Parking, Access and Manoeuvring Areas” (v) any relevant Australian Standard that applies to that type of work and (vi) any alternative specifications that Council has agreed to in writing and which the developer must ensure do not conflict with any requirements imposed by any applicable laws and standards. 86. Maintain a total of 187 existing car parking spaces on the site, for use by Stages 1, 2 and 3 in accordance with the approved plans. 87. All carparking spaces and driveway areas are to be sealed with an approved impervious surface. Surfacing shall consist of either patterned, reinforced concrete, concrete pavers, segmental clay pavers, asphaltic hotmix or two coat (primerseal/seal) bitumen seal. 88. Services and infrastructure required in connection with the establishment of the approved development must be provided at no cost to Council. 89. Landscaping shall be undertaken in accordance with approved Plan No. 1035-004 Issue B Landscape Plan and Site Section - Stage 3 dated 18/03/2011 As Amended in Red prior to the commencement of the use. 90. Any damage to roads and infrastructure that is attributable to the progress of works on the site or vehicles associated with the development of the site, must be repaired to Council’s satisfaction or the cost of repairs paid to Council. 91. Lighting of the site, including any security lighting, shall be such that the lighting intensity does not exceed 8.0 lux at a distance of 1.5 metres from the site at any property boundary. 92. All lighting shall be directed or shielded so as to ensure that no glare directly affects nearby properties. 93. Any airconditioning, generator, refrigeration, pump, exhaust, fans, processing or other equipment must be acoustically screened to ensure noise levels do not exceed 5dB above the background noise level. 94. All buildings are to comply with the approval documents. 95. Any proposed advertising devices shall be subject to a further development application and planning approval unless the advertising devices are in accordance with the exempt or self assessable requirements of the relevant Council planning scheme. 96. The developer is responsible for meeting all costs associated with the approved development unless there is specific agreement by other parties, including the Council, to meeting those costs. 97. Any conflicts associated with proposed and existing services shall be forwarded by the developer to the appropriate controlling authority for approval for any proposed changes. 98. All civil and related work shall be designed and supervised by RPEQ Registered Professional Engineers of Queensland (RPEQ) who are competent in the construction of the works. 99. All development approval conditions related to the establishment of the approved development must be fulfilled prior to any approved use commencing. 100. No nuisance is to be caused to adjoining properties and occupiers by the way of noise, odour, smoke, dust, vibration, rubbish, contaminants, stormwater discharge or siltation at any time. 101. Complete and maintain the approved development as follows: (i) generally in accordance with development approval documents and (ii) strictly in accordance with those parts of the approved development which have been specified in detail by the Council or Referral Agency unless the Council or Referral Agency agrees in writing that those parts will be adequately complied with by amended specifications. 102. Complete and maintain all operational, building and plumbing and drainage work associated with this development approval, including work required by any of the development approval conditions. 104. Stormwater must not be allowed to pond on the property being developed during the development process and after development has been completed unless the type and size of ponding has been agreed in writing by the Council or as a specific development approval condition. 105. Any increases in volume, concentration or velocity of stormwater from the property being developed must be channelled to lawful points of discharge or to other storage or dispersal arrangements which must all be agreed in writing by the Council. 106. There must be no increases in any silt loads or contaminants in any overland flow from the property being developed during the development process and after development have been completed. 107. The stormwater disposal system must be designed to include appropriate pollution control devices or methods to ensure no contamination or silting of creeks or other waterways. 108. Soil erosion and sediment is controlled in accordance with Schedule 6: “Standards for Stormwater Drainage”. 109. If there is a possibility of erosion or silt or other materials being washed off the property being developed during the development process, the developer must document and implement a management plan that prevents this from occurring. 110. During construction, soil erosion and sediment is to be managed in accordance with Schedule 7: “Standards for Construction Activity”. 111. The site must be provided with on-site effluent disposal systems designed in accordance with Schedule 5: “Standards for Sewerage Supply”. 112. The site must be provided with a water connection, up to but excluding a water meter, to the water distribution network. 113. All services installation, including sewer, water, gas, electricity and telecommunications connections to the respective networks, must comply with (i) the development approval conditions, (ii) any relevant provisions in the planning scheme for the area, (iii) Council’s standard designs for such work where such designs exist (iv) the EDROC Standards Manual where it applies (v) any relevant Australian Standard that applies to that type of work and (vi) any alternative specifications that Council has agreed to in writing and which the developer must ensure do not conflict with any requirements imposed by any applicable laws and standards. 114. At all times while the use continues, waste containers shall be maintained in a clean and tidy state and shall be emptied and the waste removed from the site on a regular basis. 115. Vehicle manoeuvring areas must be provided on-site so that all vehicles can enter and leave the site in a forward direction. 116. The landowner shall be responsible for construction and maintenance of vehicle crossovers from the road carriageway to the property boundary and for obtaining any approvals that may be required and for complying with the applicable designs and standards. 117. All landscaping, streetscaping, vehicular access, parking, roads, bikeways, footpaths, street lighting, parks, street plantings, street furniture and related items must comply with (i) the development approval conditions, (ii) any relevant provisions in the planning scheme for the area, (iii) Council’s standard designs for such work where such designs exist (iv) Schedule 2: “Standards for Roads, Car Parking, Access and Manoeuvring Areas” (v) any relevant Australian Standard that applies to that type of work and (vi) any alternative specifications that Council has agreed to in writing and which the developer must ensure do not conflict with any requirements imposed by any applicable laws and standards. 118. Provide an additional 187 car parking spaces on the site bringing the total number of car parking spaces to 374 spaces including a bus bay/drop-off bay in accordance with the approved plans. 119. All carparking spaces and driveway areas are to be sealed with an approved impervious surface. Surfacing shall consist of either patterned, reinforced concrete, concrete pavers, segmental clay pavers, asphaltic hotmix or two coat (primerseal/seal) bitumen seal. 120. Services and infrastructure required in connection with the establishment of the approved development must be provided at no cost to Council. 121. Landscaping shall be undertaken in accordance with approved Plan No. 1035-004 Issue B Landscape Plan and Site Section - Stage 4 dated 18/03/2011 As Amended in Red prior to the commencement of the use. 122. Any damage to roads and infrastructure that is attributable to the progress of works on the site or vehicles associated with the development of the site, must be repaired to Council’s satisfaction or the cost of repairs paid to Council. 123. Lighting of the site, including any security lighting, shall be such that the lighting intensity does not exceed 8.0 lux at a distance of 1.5 metres from the site at any property boundary. 124. All lighting shall be directed or shielded so as to ensure that no glare directly affects nearby properties. 125. Any airconditioning, generator, refrigeration, pump, exhaust, fans, processing or other equipment must be acoustically screened to ensure noise levels do not exceed 5dB above the background noise level. 126. All buildings are to comply with the approval documents. 127. Any proposed advertising devices shall be subject to a further development application and planning approval unless the advertising devices are in accordance with the exempt or self assessable requirements of the relevant Council planning scheme. 128. The developer is responsible for meeting all costs associated with the approved development unless there is specific agreement by other parties, including the Council, to meeting those costs. 129. Any conflicts associated with proposed and existing services shall be forwarded by the developer to the appropriate controlling authority for approval for any proposed changes. 130. All civil and related work shall be designed and supervised by RPEQ Registered Professional Engineers of Queensland (RPEQ) who are competent in the construction of the works. 131. All development approval conditions related to the establishment of the approved development must be fulfilled prior to any approved use commencing. 132. No nuisance is to be caused to adjoining properties and occupiers by the way of noise, odour, smoke, dust, vibration, rubbish, contaminants, stormwater discharge or siltation at any time. 133. Complete and maintain the approved development as follows: (i) generally in accordance with development approval documents and (ii) strictly in accordance with those parts of the approved development which have been specified in detail by the Council or Referral Agency unless the Council or Referral Agency agrees in writing that those parts will be adequately complied with by amended specifications. 134. Complete and maintain all operational, building and plumbing and drainage work associated with this development approval, including work required by any of the development approval conditions. 136. Stormwater must not be allowed to pond on the property being developed during the development process and after development has been completed unless the type and size of ponding has been agreed in writing by the Council or as a specific development approval condition. 137. Any increases in volume, concentration or velocity of stormwater from the property being developed must be channelled to lawful points of discharge or to other storage or dispersal arrangements which must all be agreed in writing by the Council. 138. There must be no increases in any silt loads or contaminants in any overland flow from the property being developed during the development process and after development have been completed. 139. The stormwater disposal system must be designed to include appropriate pollution control devices or methods to ensure no contamination or silting of creeks or other waterways. 140. 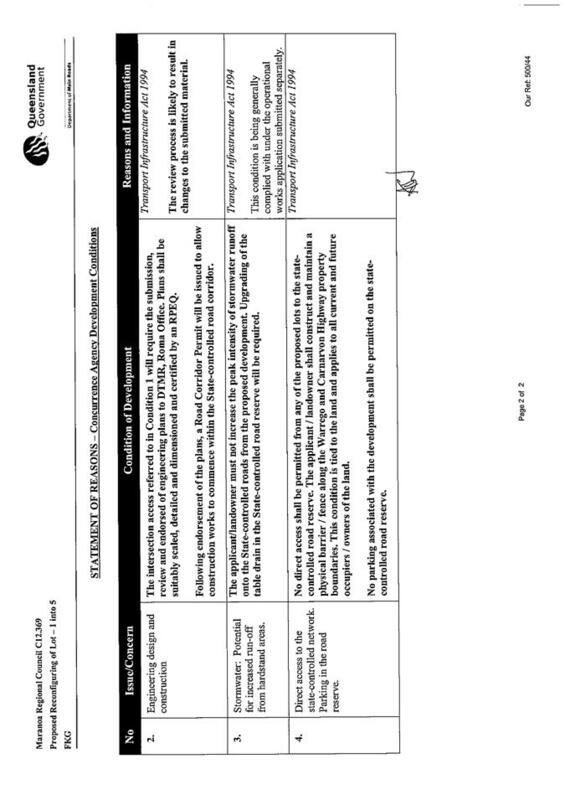 Soil erosion and sediment is controlled in accordance with Schedule 6: “Standards for Stormwater Drainage”. 141. If there is a possibility of erosion or silt or other materials being washed off the property being developed during the development process, the developer must document and implement a management plan that prevents this from occurring. 142. During construction, soil erosion and sediment is to be managed in accordance with Schedule 7: “Standards for Construction Activity”. 143. The site must be provided on-site effluent disposal systems designed in accordance with Schedule 5: “Standards for Sewerage Supply”. 144. The site must be provided with a water connection, up to but excluding a water meter, to the water distribution network. 145. All services installation, including sewer, water, gas, electricity and telecommunications connections to the respective networks, must comply with (i) the development approval conditions, (ii) any relevant provisions in the planning scheme for the area, (iii) Council’s standard designs for such work where such designs exist (iv) the EDROC Standards Manual where it applies (v) any relevant Australian Standard that applies to that type of work and (vi) any alternative specifications that Council has agreed to in writing and which the developer must ensure do not conflict with any requirements imposed by any applicable laws and standards. 146. At all times while the use continues, waste containers shall be maintained in a clean and tidy state and shall be emptied and the waste removed from the site on a regular basis. 147. Vehicle manoeuvring areas must be provided on-site so that all vehicles can enter and leave the site in a forward direction. 148. The landowner shall be responsible for construction and maintenance of vehicle crossovers from the road carriageway to the property boundary and for obtaining any approvals that may be required and for complying with the applicable designs and standards. 149. All landscaping, streetscaping, vehicular access, parking, roads, bikeways, footpaths, street lighting, parks, street plantings, street furniture and related items must comply with (i) the development approval conditions, (ii) any relevant provisions in the planning scheme for the area, (iii) Council’s standard designs for such work where such designs exist (iv) Schedule 2: “Standards for Roads, Car Parking, Access and Manoeuvring Areas” (v) any relevant Australian Standard that applies to that type of work and (vi) any alternative specifications that Council has agreed to in writing and which the developer must ensure do not conflict with any requirements imposed by any applicable laws and standards. 150. Provide an additional 114 car parking spaces bringing the total number of car parking spaces to 488 spaces including a bus bay/drop-off bay on the site in accordance with the approved plans. 151. All carparking spaces and driveway areas are to be sealed with an approved impervious surface. Surfacing shall consist of either patterned, reinforced concrete, concrete pavers, segmental clay pavers, asphaltic hotmix or two coat (primerseal/seal) bitumen seal. 152. Services and infrastructure required in connection with the establishment of the approved development must be provided at no cost to Council. 153. Landscaping shall be undertaken in accordance with approved Plan No. 1035-004 Issue B Landscape Plan and Site Section - Stage 5 dated 18/03/2011 As Amended in Red prior to the commencement of the use. .
154. Any damage to roads and infrastructure that is attributable to the progress of works on the site or vehicles associated with the development of the site, must be repaired to Council’s satisfaction or the cost of repairs paid to Council. 155. Lighting of the site, including any security lighting, shall be such that the lighting intensity does not exceed 8.0 lux at a distance of 1.5 metres from the site at any property boundary. 156. All lighting shall be directed or shielded so as to ensure that no glare directly affects nearby properties. 157. Any airconditioning, generator, refrigeration, pump, exhaust, fans, processing or other equipment must be acoustically screened to ensure noise levels do not exceed 5dB above the background noise level. 158. All buildings are to comply with the approval documents. 159. Any proposed advertising devices shall be subject to a further development application and planning approval unless the advertising devices are in accordance with the exempt or self assessable requirements of the relevant Council planning scheme. 160. The developer is responsible for meeting all costs associated with the approved development unless there is specific agreement by other parties, including the Council, to meeting those costs. 161. Any conflicts associated with proposed and existing services shall be forwarded by the developer to the appropriate controlling authority for approval for any proposed changes. 162. All civil and related work shall be designed and supervised by RPEQ Registered Professional Engineers of Queensland (RPEQ) who are competent in the construction of the works. 163. All development approval conditions related to the establishment of the approved development must be fulfilled prior to any approved use commencing. 164. No nuisance is to be caused to adjoining properties and occupiers by the way of noise, odour, smoke, dust, vibration, rubbish, contaminants, stormwater discharge or siltation at any time. - Public Notification has been undertaken in accordance with SPA. The applicant has appeal rights under SPA against any decision of Council. The application generally accords with the Policy position of the Roma Town Planning Scheme. Any conditions imposed will be at the cost of the applicant. Corporate Plan 2009-2013 — 8.3.1(a) Regulate and control development in a consistent and responsible manner that enhances the lifestyle of our community whilst promoting sustainable development. The application is for a Material Change of Use – Undefined Use (Temporary Workers’ Accommodation), to create 1008 persons accommodation in 5 stages. Each unit incorporates a bedroom and bathroom, with access to communal recreation, kitchen and dining amenities. The camp consists of 34 clusters of buildings with seven buildings per cluster. An office and training building, dry store, laundry and maintenance shed are also included on site. The proposed development includes a total of 488 car park spaces on the site with a total of 187 spaces being provided upfront for Stages 1, 2 and 3, an additional 187 spaces provided for Stage 4 and an additional 114 spaces provided for Stage 5. A bus bay/drop-off bay is provided within the car parking area, as the applicant advised a majority of residents will be fly in/fly out workers. Motor vehicle access to the site will be obtained from a new road off Carnarvon Highway via an 11.5 metre wide driveway crossover. The development includes a manoeuvring area on the site, to be developed as part of Stages 1, 4 and 5 of the development. “Undefined Use” means any use not defined in this section. The site is situated at corner Warrego and Carnarvon Highways, Roma Qld 4455 and described as Lot 6 on RP227971 (refer Figure 1 - Locality Plan). The site is situated in the Industrial Zone of the Town Area in the Roma Town Planning Scheme (refer Figure 2 - Zoning). The site is currently vacant (refer Figure 3 - Aerial Photograph). The site is adjoined by a vacant lot to the south and west. 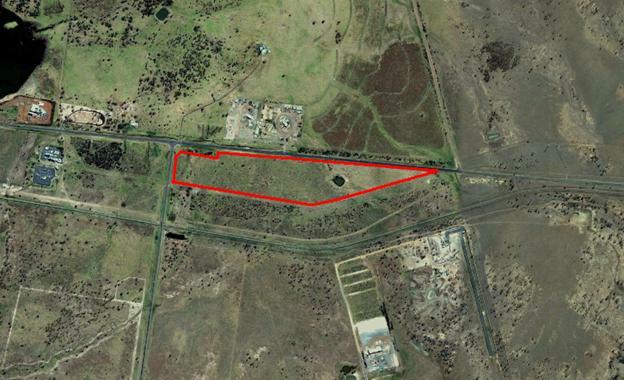 A storage yard is adjacent to the site to the north, across from the Warrego Highway (refer Figure 3 - Aerial Photograph). An industrial subdivision was approved on the site to create five industrial lots. 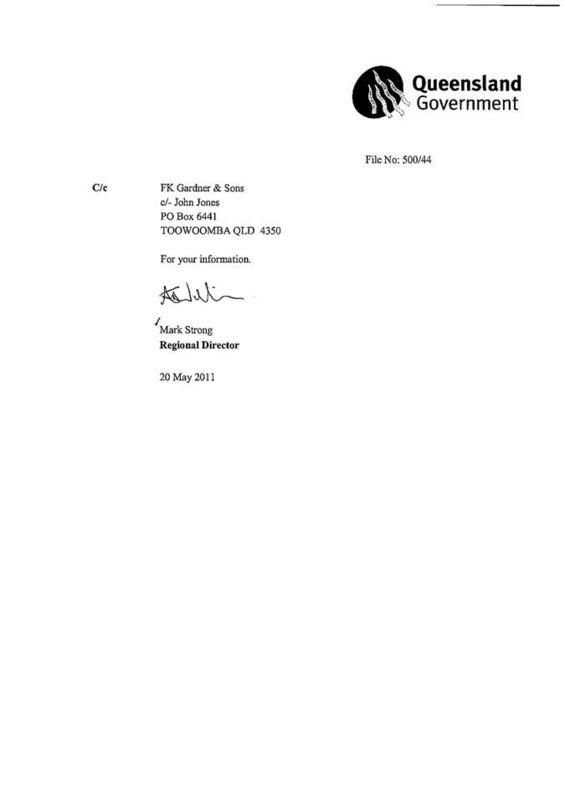 The subdivision is currently at Operational Works approval stage and has not been titled. The proposed development will be located on proposed Lots 2-5 of the approved subdivision. (f) if the assessment manager is an infrastructure provider—the priority infrastructure plan. There has been no conflict identified with these provisions of the Sustainable Planning Act 2009.
a) The areas of high scenic amenity, remnant vegetation, wetlands, fauna habitats and wildlife corridors and regionally significant open space in the town are protected. The subject site contains minimal vegetation and no features of environmental significance. The site is not in proximity to any environmentally significant areas, including wetlands, habitats, corridors and open spaces, and the proposed development will not adversely impact the natural environment. b) Places, areas or sites identified as being susceptible to land degradation, including contamination, erosion, salinity and landslip, are protected and further degradation is minimised. The subject site is not identified as being susceptible to land degradation and therefore will not be adversely impacted by contamination, erosion, salinity or landslip. c) Ecological sustainability is achieved by maintaining and improving biodiversity, water and air quality. The proposed development is located within an established urban area and will not adversely impact on biodiversity, water or air quality. d) Places of historical and indigenous cultural heritage and social significance are protected, maintained and enhanced. The site is not identified as being in proximity to a place of historical, cultural or social significance. a) Business and commercial development shall be located within the Commercial Zone to promote and strengthen the existing central Business District. The proposal is for Temporary Workers’ Accommodation in an industrial area, and will not impact on the location of business and commercial development within the Commercial Zone. b) The Central Business District (CBD) or inner core of the commercial Zone is intended to contain the more intensive commercial uses. Entertainment facilities and tourist accommodation will also be favoured within and adjacent to the CBD to provide a central focus of activity and promote vitality after office hours. The proposal is for Temporary Workers’ Accommodation in an industrial area, and will not compromise the ability of the CBD to contain intensive commercial uses. c) Beautification and improved parking facilities will enhance the efficiency, attractions and vitality of the Town CBD. The proposed development is not located in the Roma Town CBD. The proposed development provides appropriate onsite parking for the use. d) Tourism will be promoted with significant economic and social benefits to the town as a regional centre with close association with the oil and gas industry and the proximity of the Carnarvon National Park. The proposed development provides accommodation for employees of the oil and gas industry, which can lead to tourism and economic benefits to the town. e) Industry, business and employment opportunities are improved and appropriately located to service the community and region, and encourage economic activity within the local area. The proposed development is for Temporary Workers’ Accommodation in an industrial area, which will support industry, business and employment opportunities by providing accommodation for workers placed in Roma. The site is removed from existing industrial uses and is not expected to impact upon current industrial operations. a) Convenient access to roads and services is achieved through well located land uses and the efficient use and timely provision of infrastructure such as water, sewerage and roads walkways and cycling facilities. The proposed development is located on the corner of Warrego and Carnarvon Highways, and has convenient access to well established road infrastructure. The staging of the proposed development will ensure the efficient and timely provision of infrastructure to the site. b) Infrastructure networks such as road and rail, water cycle and electricity infrastructure are protected from encroachment by sensitive land uses which may adversely affect or limit the normal operation of that infrastructure. The proposed development is not located in proximity to rail, water, cycle and electricity infrastructure networks. Department of Transport and Main Roads are a concurrence agency for the application and have included conditions to minimise adverse impacts on the road infrastructure. c) Rural residential and urban residential development occurs in distinct localities that provide a sense of community, amenity, services, and a safe, affordable living environment, whilst maintaining the rural amenity of the Town Area. The proposed development provides temporary workers accommodation, which provides recreational, kitchen and dining, laundry and ablutions facilities onsite creating a self contained development. The proposed development maintains the rural ambience of the surrounding area through staging and clustering of units, with appropriate buffering to Warrego Highway. d) The adverse effects from natural and other hazards, including bushfires are minimised. The site is not subject to natural or other hazards. e) The range of housing types, services and facilities meets the needs of the community and other uses. The proposal is for Temporary Workers’ Accommodation and will provide accommodation, recreational facilities and parking for workers placed in Roma. The development provides an alternative housing option to meet the community needs. f) Community well being is not compromised by inappropriate development that impacts upon noise levels, traffic volume, lighting levels, local amenity. The proposed development is located in an industrial area to the east of the Town CBD. The location of the site is distant from residential uses and minimises impacts from noise, traffic volume and lighting levels on the amenity of the units. a) Roma is a focus for a range of business, industrial, tourist, community and recreational activity in the local government area. The proposed development is for temporary accommodation purposes that will support the expansion of business, industrial, tourist, community and recreation activity in the local government area. b) Business and commercial development is located primarily in the CBD to provide central and accessible services to the local government area. The proposal is for a Temporary Workers’ Accommodation in an industrial area located outside the CBD. The proposed development will not adversely impact on the ability of the CBD to accommodate business and commercial development. c) The residential and heritage character and amenity of the Urban Area is retained. The proposed development is located within an Industrial Area and does not impact on residential and heritage character and amenity of the Urban Area. d) Safe and convenient access for pedestrians and cyclists is maintained and enhanced. The proposed development will ensure pedestrian links throughout the site are established and maintained. e) Residential (including Rural Residential) development occurs where there is no adverse impact on Good Quality Agricultural Land. The proposed development is located on a site mapped as being Good Quality Agricultural Land. However, the site and surrounding areas are located in the Industrial Zone, with some form of large scale or industrial development intended to occur in the area in the future. The proposed development is located within a recent industrial subdivision and will not result in further fragmentation of Good Quality Agricultural Land. f) Residential development is buffered from the existing and proposed road and rail corridors to minimise any detrimental impact. The proposed development is located on the corner of Warrego and Carnarvon Highways, however the proposed development is distant from the Carnarvon Highway frontage of the site. The development is setback 16.9 metres increasing to 27.1 metres from the Warrego Highway frontage of the site. The proposed development will not pose any detrimental impact to the existing road network. g) Residential development accommodates a range of housing types and allotment sizes, and provides a safe and pleasant living environment, with adequate access to community services and is located in the residential preferred areas shown on the Urban Area Maps in the appendices. The proposed development is for Temporary Workers’ Accommodation. The development provides for accommodation for workers placed in Roma, and incorporates recreational areas, dining and kitchen facilities and car parking areas and its surrounds. The development is designed to be self contained, and will alleviate the need for accommodation and associated amenities in the Town CBD. The availability of services and facilities onsite creates a safe and pleasant living environment for the residents. h) The expansion of residential development occurs in areas where it is most cost effective to supply physical infrastructure, such as water, sewerage, roads and electricity. The proposed development will be constructed in five stages, with infrastructure provided at each stage to ensure timely and cost efficient provision of infrastructure. i) Efficient and equitable access to social infrastructure, such as schools, neighbourhood shopping, community services, public transport services, and parks are provided in residential areas. The proposal is not located in a residential area, however the site has efficient access to neighbourhood shopping centres, community services and parks. j) Industrial development is located in the Industrial Zone of the town (see maps in appendices). The proposal is for temporary residential development, where once the temporary workers’ camp is abandoned, future industrial uses can be located on the site. k) Impacts of industrial uses are required to be within acceptable limits and uses are undertaken in a sustainable manner consistent with the amenity and character of the area concerned. The proposal is for temporary residential development. l) Small scale business, community and emergency services are provided for the needs of the local community. m) All Areas other than the Commercial Zone are protected from shopping centre and other forms of commercial development. The proposal is for temporary residential development in an Industrial Zone. The proposed development will be connected to electricity supply as a condition of development. The proposed development will be connected to reticulated water supply as a condition of development. Onsite sewerage treatment plant will service the site and will be of a sufficient size to cater for the number of persons for each stage. A separate application for an Environmentally Relevant Activity (ERA) will be required for lodgement to DERM. This will be a condition of development. The proposed development will provide an appropriate stormwater drainage system in accordance with the standards in Schedule 6: “Standards for Stormwater Drainage”. The proposed development includes an 11.5 metre wide driveway crossover accessed from a new road constructed as part of the recent subdivision off Carnarvon Highway, which will be developed to a standard appropriate for the use. The density of residential activities does not impact adversely on the residential amenity of the town. N/A - The proposed development is for a Temporary Workers’ Accommodation. The proposed development includes a total of 488 car parking spaces. Stages 1, 2 and 3 are provided with a total of 187 spaces and all to be constructed as part of Stage 1. Stage 4 is provided with an additional 187 spaces and Stage 5 is provided with an additional 114 spaces. A bus bay and drop-off bay is provided where a majority of workers will be fly in fly out workers. The proposed number of car parking spaces is considered sufficient to cater for the needs of the residents and staff on the site. Adequate vehicle manoeuvring areas are provided on the site, including a refuse collection area for Stages 1, 4 and 5. All weather road access is provided to the premises. State Controlled Roads are maintained and enhanced as a link between major centres. Development adjacent to State Controlled Roads is located to ensure safe and efficient use of the highway and maintain the integrity of the highway as a commuter link. The development is setback 16.9 metres from the Warrego Highway, and is well setback from the Carnarvon Highway. The development will obtain access from a new road off the Carnarvon Highway, and will have a negligible impact on the safety and efficient use of the highway. 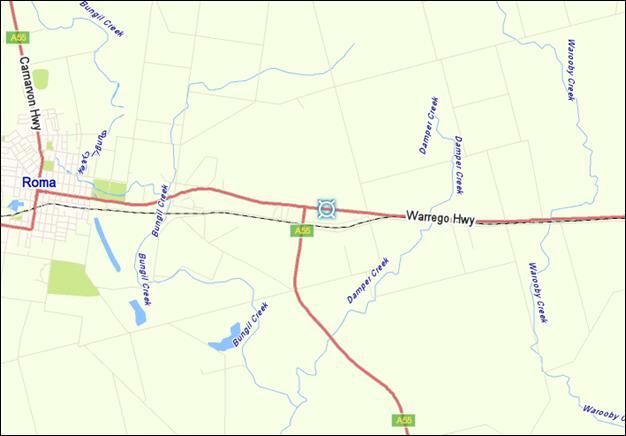 Extensive landscaping is proposed and conditioned along the Warrego Highway boundary of the development, to further minimise potential impacts. Noise sensitive developments (residential, education and community) must ensure that road traffic noise levels are appropriately managed to achieve acceptable levels of amenity. The development is setback 16.9 metres from the Warrego Highway, and is well setback from the Carnarvon Highway. Landscaping is proposed within this setback to mitigate road traffic noise levels to the development. A 5 metre wide dense landscape buffer will also be established to the north and south of the accommodation units, to further reduce noise impacts to the development. N/A - The proposed development is not in the vicinity of the aerodrome. The subject site is located at an appropriate distance from pipelines. Premises are located at an appropriate distance from refuse tips and effluent treatment plants to ensure community safety and operation of the uses are not compromised. The subject site is not within proximity to refuse tips and effluent treatment plants. The subject site is an appropriate distance from the rail corridor. Development adjoining the rail corridor is protected from the impact of noise. The proposed development is situated more than 100 metres from the rail corridor. A landscape buffer is proposed to the south and the north of all accommodation unit buildings, to further mitigate any noise impacts on the proposed development. N/A – The site is not located in proximity to any watercourses. N/A – The proposed development is not in close proximity to any areas of significant biodiversity and habitat value. The site is not mapped as being subject to a 1 in 100 year flood event. The proposed development will not cause environmental harm or nuisance from air emissions. The proposed development is located in an industrial area and is situated well away from sensitive land uses in the Town CBD. (e)Minimises nuisance or harm to adjoining land owners. Appropriate water quality treatment devices will be included in the stormwater collection and dispersal system. This will be included as a condition of development. N/A – The proposal does not involve excavation or filling. Construction will implement erosion control and silt collection measures to ensure protection of environmental values. (b) the provision of firebreaks to ensure adequate setbacks between Buildings, structures and Hazardous vegetation. The proposed development is not within an area of High or Medium Bushfire Hazard. Development adjacent to buildings identified as heritage or character buildings within Schedule 9 incorporates design features, materials and details that blend with the existing character of the adjoining buildings and/or place. N/A – The site is not in proximity to buildings identified as heritage or character buildings. N/A – The site is not in proximity to known places of indigenous and/or cultural heritage value. Not Applicable – The subject site is within the Industrial Zone. The scale and location of the industrial use on the site should contribute to the amenity of the Zone. The total site cover of the proposed development is 11.3%. All buildings and structures are limited to less than 10 metres in height and one storey. Building clearances are a minimum of 16.9 metres from the boundaries of the site. Vehicular movements connected with uses in the industrial area ensure that the amenity of the adjacent residential area is not adversely affected. Landscaping is proposed between all vehicle manoeuvring and car parking areas and the proposed units. This will ensure visual amenity is maintained on the site, and any adverse impacts by way of noise or air pollution are minimised. b) reduces the impact of the size and scale of the buildings. c) does not interfere with electricity infrastructure items. Landscaping with a minimum width of 5 metres is provided to the north and south of the units. Vegetation will have a mature height of at least 3 metres within 5 years of planting, and ground covers will fully cover the vegetation strip within 1 year of planting. Landscaping will occur in accordance with Plan No. 1035-004 Issue B Landscaping Plan & Site Section as a condition of development. The amenity of residential uses adjacent to the industrial areas is protected through appropriate boundary screening. N/A – The site does not adjoin residential uses. The building is designed and orientated to be identifiable from the street. The office and training building on the site is located at the entrance to the internal driveway and is easily identifiable from the street. Buildings are designed and finished to a high quality appearance. Buildings will be designed and finished with a high quality appearance. Development is operated in such a manner that ensures that the local amenity is protected. N/A – The proposal is for a Temporary Workers’ Camp and does not require restricted operating hours. The loading and unloading of goods occurs at the appropriate times to protect the amenity of the Industrial Area and surrounding areas. The proposal is for a Temporary Workers’ Camp and will have limited delivery of goods. b) Not to prejudice the consolidation of like non-Industrial activities in other more appropriate areas. The proposed Temporary Workers’ Accommodation is located to the east of the Town CBD and is capable of being serviced with an adequate level of infrastructure. The site is surrounded by predominantly vacant land, with the nearest industrial development, a storage yard, being situated adjacent the site to the north. The Temporary Workers’ Accommodation will include a sunset clause to enable future industrial uses to be constructed on the site once the temporary workers camp has ceased operation. Therefore, the proposed development will not adversely impact on the function, operation and character of the Industrial Zone. Note: It was determined by Council, in a workshop on 2-11-11, to restrict the approval to a seven (7) year time frame for all stages. This requirement has been incorporated into the conditions. Not Applicable – The subject site is for Temporary Workers’ Accommodation. Lack of recreation space and facilities will lead to an increase in drunkenness and violence by workers in the camp. The proposed development provides sufficient recreation space and facilities for workers. Three amenities buildings are provided, each with a kitchen and dining area, ablutions area and recreation area. Four undercover barbeque areas are also provided on site. The camp is also provided with two tennis courts and a pool. The amount of recreational facilities and space proposed is considered to be sufficient to cater for the needs of the workers, with increased activities on-site reducing the need for workers to travel to the Roma Town Centre for recreation and create adverse social impacts on residents in town. A formal assessment of the social and economic impacts of the development should be conducted. The development will have positive economic impacts for Roma, by encouraging rural and agricultural production. 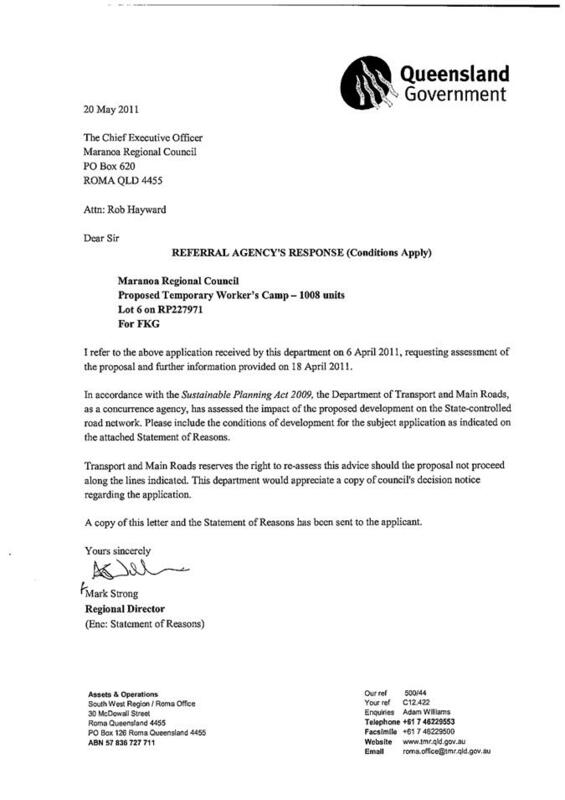 The proposed worker’s camp is intended to provide temporary accommodation for the influx of workers into Roma. The development is designed to be self contained and will alleviate the need for accommodation and associated amenities in the Town CBD. The provision of a number of on-site recreational facilities, and the camp’s distance from the Town CBD, will ensure that the functions of the Roma Town Centre will not be adversely affected by the workers to be accommodated. Council is preparing a policy statement to deal with this issue for future developments of this nature. The development has the potential to cause strain to existing infrastructure. Water collection and treatment measures should be put in place. The proposed development will provide an onsite sewerage treatment plant. The proposed development will be constructed in stages to minimise the impact of the existing infrastructure. This will ensure that the development does not strain the existing infrastructure in Roma. Potential commercial development in what is now recreational space could have negative impacts on the appearance of Roma. The development should be built to blend in rather than stand out and highway frontages should be beautified. The site is zoned Industrial and is currently vacant. The proposed development is considered to be an improvement to the existing appearance of the site, through the use of landscaping throughout the site, within car parking areas and adjacent to the Warrego Highway frontage of the site. The bulk of the proposed development is consistent with the surrounding industrial development and will not adversely impact on the visual amenity of the surrounding locality. It should be noted that uses of this type are temporary in nature and the site will revert to industrial when the use is discontinued. Subsequent approval for Building and Operational works will be required. ERA approval will be required for the on-site sewerage system. Note: negotiations are underway with council to amend the layout of the approved ROL with the view to reducing the amount of lots. This boundary realignment will not affect the circumstances of this MCU.